Plastic Spray Bottle For Cleaning Liquids. Quick N Brite Branded With Mixing Instructions. This popular cleaning tool is the same one that is included with some of our Quick N Brite packages, but it can also be used with other cleaning liquids too. It is a higher quality spray bottle so it will perform better, and last longer than other options. The 16 oz. size provides plenty of capacity for most people without becoming overly bulky, and a comfortable trigger allows for adjustment from fat to thin spray patterns. The superior components have a nice feel in your hand, and reliable action when cleaning. Simply twist the pink tip one way or the other to choose the amount of liquid being shot out, or twist it all the way to prevent spraying when stored. A gentle tug of the trigger will dispense cleaning solution right where you need it. It has pre-printed instructions for common cleaning jobs on the back, and even reminds you of the correct amount of cleaner to add when mixing a heavy or light solution. It is branded with the Quick N Brite logo on the front, but this does not prevent you from using it with any other liquid. To make an all purpose Quick N Brite spray, fill the bottle with hot water, and then add in 1/2 oz QB. Twist the lid on tight and shake thoroughly to mix. This powerful mixture can be used all over to replace several job specific cleaners you are using now. To make a light solution for windows and mirrors, fill the bottle with hot water and then add 1/2 tsp QB and shake. This will easily replace any blue spray you are using now for a fraction of the cost. Use on glass, stainless steel and other surfaces to clean thoroughly without leaving streaks. Use a light solution. Spray on and then wipe off. If streaking occurs it is because you have too much cleaner in the bottle. Pour out 1/4 of the bottle, add water and start over. Use a heavy solution. Spray on generous amounts onto surface, then lightly work in with a wet terry cloth towel and a side to side motion. Wipe off and rinse using a damp towel. Apply a heavy solution to the surface with a non-abrasive scrub sponge or terry cloth towel. Hose off or wipe to rinse. Use the heavy solution. Spray on and wipe off right away. Safe for any surface that is able to get wet with water, and effective for nearly any stain or type of dirt. Order Yours Today! Uses Perfect for mixing and diluting Quick N Brite, but also useful for any other cleaning liquid too. Dimensions (l x w) 10" x 4.5"
Spray Adjustment Yes. Twist to select wide or thin pattern. Directions Yes. Printed instructions are included on back for common jobs and mixes. 16 oz. 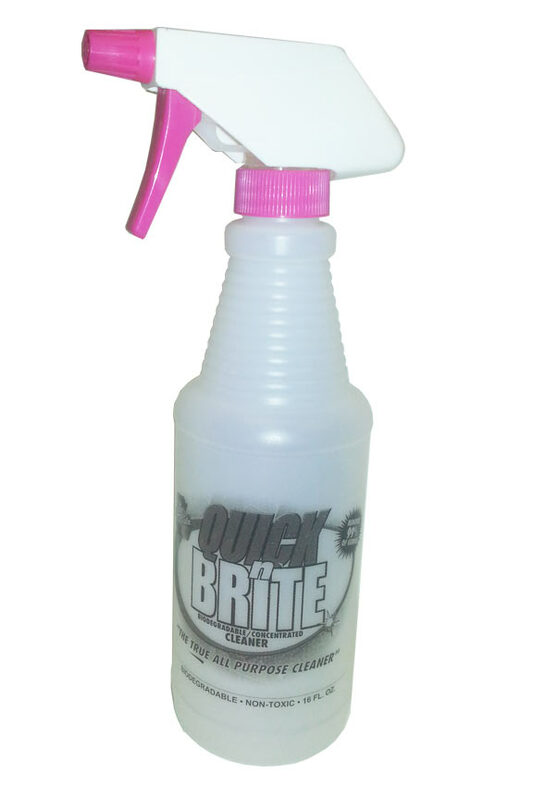 Spray Bottle - Get one to make mixing and spraying liquid Quick N Brite easy, or use with any other liquid instead. Higher quality components will last longer and perform better. Order Yours Today! I did not read the description correctly. I did not realize it was an empty bottle. Bought it for the soot left from a closed vent fire in our fireplace, and it worked fast and easily to remove all the soot. No smell, no gloves, and very little cleanup. I'm definitely impressed and plan to try it on our fiberglass shower. Thanks for such a great product! The spray bottle worked well. I only wish it came in a bigger size. Maybe a 32oz. I had to refill It many times for my project. Makes it really easy to use the Quick'n Brite cleaning agent. Cuts thru kitchen grease like a charm. Air? These are empty spray bottles. They are made from plastic, but there are no ingredients inside. 8 of 16 Customer(s) found this Answer helpful. Bendable Microfiber Dusting Tool With Telescoping Pole. Super Strength Stain Remover and Bleach Alternative. Natural Cleaning Solvent for Easy Mixing or use in Steam Cleaners.